Iran has asked Austria’s government to take immediate measures to protect the cyber security of nuclear talks, media reported Saturday after reports emerged of suspected espionage at negotiation venues. Swiss and Austrian authorities said on Thursday they had opened separate investigations into alleged spying in hotels where the nuclear talks with Iran are taking place. IT experts pointed the finger at Israel, but deputy foreign minister Tzipi Hotovely on Thursday denied that its secret services were involved. In a statement, Iran’s embassy in Austria, “demanded Austria’s foreign ministry immediately provide all required security measures for the talks, including enhanced security for the venues as well as better cyber protection,” the ISNA news agency reported. Iranian embassies in Vienna and Bern, in separate notes, also asked the Austrian and Swiss foreign ministries to inform them of “the results of spying investigations” by both governments on nuclear talks. A Russian-based security firm said on Wednesday the malware dubbed Duqu, a sophisticated spy tool believed to have been eradicated in 2012, appeared to have been used to spy on the nuclear negotiations. The investigations come as the clock ticks down to a June 30 deadline for an accord between Iran and world powers. 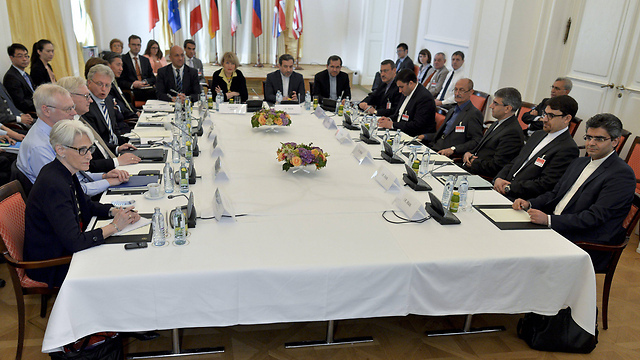 Iran and the P5+1 group (Britain, China, France, Russia, the United States and Germany) have held numerous rounds of discussion since November 2013, mostly in Switzerland and Austria. Deputy ministers and experts from both sides are now in Vienna seeking to clinch a deal that curtails Tehran’s nuclear programme in return for relief from punishing sanctions. Iran denies western allegations that it is covertly pursuing a nuclear weapon and insists its atomic activities are for peaceful energy purposes.